You just got through Thanksgiving and now your sights are set on the upcoming holiday season. This is the time of year when thoughts of sugar plums are dancing through your heads. Without a doubt, you will be keeping very busy for the next several weeks. When you aren’t commuting to and from work, you will be spending time driving to the big-box stores do to your holiday shopping, driving out to the country to chop down a Christmas tree and stopping at Starbucks as often as possible to refuel with a Caramel Macchiato. But what you are not thinking about right now is the fact that the weather is about to drastically change. The delightful fall temperatures you have been enjoying as of late are about to change. Before you know it, winter will be here in full force bringing with it cold temperatures and snow. And when this happens, you will suffer a foggy and frosty windshield and windows when you leave your car out in the open. The worst part about this is the fact it takes so long to defrost your windshield. In the meantime, all you can do is sit there freezing, waiting for your windshield to clear up enough so you can see. 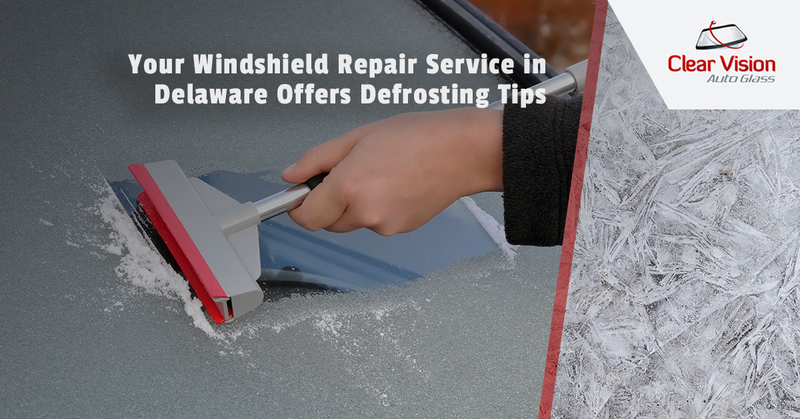 But there is no need to fret, Clear Vision Auto Glass, your windshield repair service in Delaware, offers you a few tips that will speed up the defrosting process. Start your engine and set the heater to defrost, and then crank it up all of the way to absorb the excess moisture in your car. Hot air holds more moisture. This might sound bizarre, but when you activate the air conditioning setting on your car, the system helps dry the air in the cab even faster. Fresh air works much better than recirculated air when trying to defrost your windshield. Because of this, make sure your heater settings aren’t on recirculate. A cracked window helps with the exchange of the dry air outside and the humid air in your car. No kidding, it really does speed up the defrosting process. As winter quickly approaches, remember to make sure your car is in good working order. The only thing worse than breaking down in the middle of nowhere is breaking down in the middle of nowhere when it is freezing outside and snowing. Now is a great time to take your vehicle to the mechanic and have them give it a good looking over. If you are driving on summer tires, you might want to seriously consider swapping those out for a set of winter tires. At the very least, you should be riding on all-season tires. Lastly, now is a good time to take your car in and have the windshield checked. Any cracks or stars you have now could expand over the winter months. If you need windshield repair, contact Clear Vision Auto Glass today.